What’s the mark of a great WordPress host? After 10+ hosts I’ve learned that it all comes down to this: How often you have to think about them? When you have to ask “Why is my website so slow?” or “Why is my website down?” or “Should I update to the latest version of WordPress?”, that’s time away from things that actually matter to you and your business/blog. 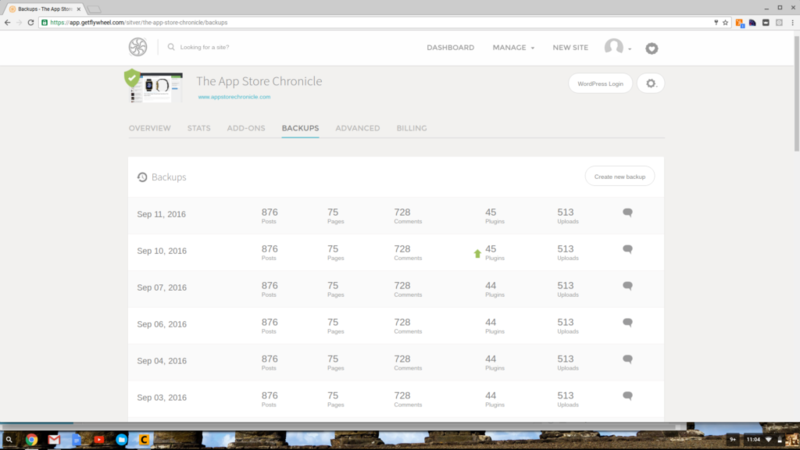 The Backup screen for The App Store Chronicle on Flywheel. When you host a site with Flywheel, you sacrifice a bit of control. Unlike many hosts, there is no SSH access or CPanel interface available. Certain settings cannot be changed. What you get in return for this sacrifice is a beautiful, simple interface for doing the important little tasks you might need to do when managing your website. Updates and backups are conducted automatically. Thirty days of backups are stored right in Flywheel’s dashboard. Restoring a backup from yesterday, a month ago, or a year ago takes only one or two clicks. The interfaces for advanced tasks like editing the database, flushing the cache, or updating DNS are much cleaner and more refined than in any other host I’ve used (although Digitalocean’s tools are well-designed, if not WP-specific). As a result of being an agency-focused host, Flywheel’s dashboard is also quite intuitive for managing a number of sites in one place. With just a click or two you can clone your site, or turn it into a template, a “blueprint” in their terminology. For agencies/creatives who don’t want to pay for hosting the site while they’re building it, Flywheel offers a feature called “Demo Sites” which allows you to host a site with them for free while you design it. Your site will be password-protected, and it will auto-delete in two weeks unless you extend or activate it, but either action only takes a few more clicks. Cool, huh? So while Flywheel lacks some of the most advanced features of hosts like Digitalocean and Godaddy, it makes up for it in intuitive, beautiful admin areas that make common (and even advanced) tasks painless. Flywheel’s speed and performance numbers aren’t record-breaking, but they’re very good. In a testament to the reliability of their underlying technology, I can’t recall the last time my Flywheel site crashed or went offline. It may have happened at some point, but I don’t remember the instance. This contrasts sharply with my experience with discount hosts like Hostgator and Godaddy which seemed to crash weekly when I was a customer (although these issues seem to have been mitigated in newer WordPress hosts like Google Cloud Platform, Digital Ocean, and Amazon Web Services). Thanks to the infrastructure that Flywheel hosts on, even when my site has gone super-viral and seen 100-1000+ concurrent visitors, my site has stayed up and speedy (on a $15/month plan). That’s really impressive. Flywheel’s support is probably its biggest selling point. A lot of this stems from that Flywheel is a “managed” hosting provider. They specialize in WordPress, so they know it inside and out. They monitor sites for malware and security issues, automatically (and safely) upgrade my site to the latest version, and back up the site on a daily basis. Having been hacked before, this is a real comfort to me. I feel good that if something fishy/nasty targets me, my site, one of my longest-term projects, is safe. They’ll also handle complex tasks like migration from an old host for you (for free). When an issue came up that requires support, Flywheel’s support team usually did a very good job of helping me work through the issue. When you call or email many hosts (looking at you Godaddy), you wait on hold to speak to a call center in India. If you’re lucky, those hosts might patch you through to a call center somewhere in Nevada with a contract worker who may be able to answer your question. When I have a question or an issue in Flywheel, I can usually send out an email and get a solution in under an hour (or much less if I call). Their support team is well-trained and US-based, and often employees from throughout the company will help with support tasks. I’ve even had support emails answered by their CEO (see above). They also have an extensive support help center, with articles on everything from setting up DNS, to restoring backups, to WordPress best-practices. The only problem is that their support is not 24/7. They only offer support during regular business hours. 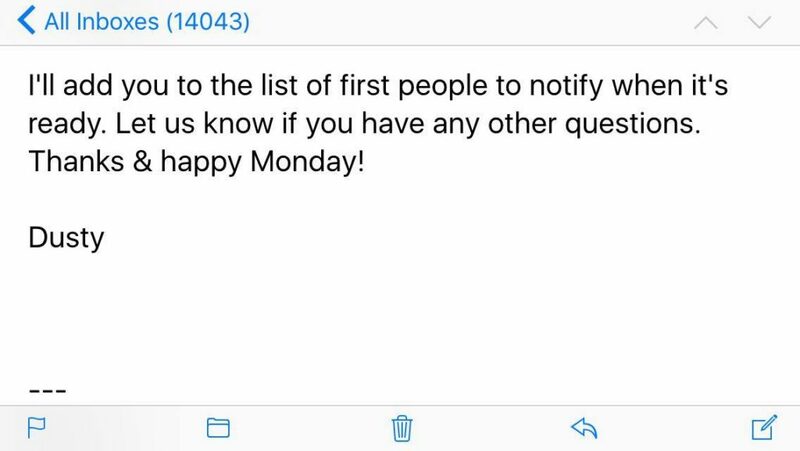 If there’s an emergency (i.e your site is down), you can email their emergency email address and wake up an employee to answer your question, but if you have any non-urgent questions over the weekend, you’ll have to wait until Monday to get answers. Flywheel is far from the cheapest WordPress host on the market. Their “Tiny” plan starts at $15 a month. Their souped-up “Professional” plan is $75 a month. Hosting on Google’s cloud platform will cost you around $5 a month, and hosting on Digitalocean will cost you $10. With that said, Flywheel’s price are very competitive for what they offer. WP Engine, one of the most well-known players in the “managed” WordPress industry, charges $99 a month for its own version of the $75 “Professional” plan, with near identical features. The “Tiny” plan is the most affordable “managed” plan I’ve seen. Flywheel will also never throttle you, charge you extra, or chastize you if you run over your limits. At worst, they’ll ask (not force, from what I can tell) you to upgrade to a larger plan the next month. Flywheel also has a few features that they charge extra for. Until recently, they used to charge $10 per month for SSL/HTTPS support, which I counted seriously against them (because Google recently prioritized HTTPS for search). As of the week I’m writing this, SSL support is included for free (and it’s super-easy to enable). Adding Multi-site support and Flywheel’s speedy CDN to your site will cost you $10 a piece, but most webmasters won’t need those add-ons. There are free, excellent alternatives to those features (i.e Cloudflare’s free CDN) that do many of the same things just as well. If you can’t tell, I’m very happy to host with Flywheel. I don’t use them to host all of my sites, because they’re a bit pricey for some purposes, but they are the most supportive, speedy, and reliable host I’ve encountered… and it keeps getting better. When I first became a customer, many of the features in their platform didn’t exist. If you’re looking for a speedy WordPress host that you don’t have to think about, Flywheel is a good choice. Flywheel is not for everyone, but would I recommend it? Hell yeah.